Terrain: Mainly on level ground, but with a small number of gentle gradients; and mostly firm, but as sections can at times be wet and muddy, strong boots are recommended. Distance: 9 kilometres (5½ miles). After leaving Lyndhurst village, the walk route for a short distance follows Beechen Lane, an ancient track-way once used by travellers journeying between Lyndhurst and Denny Lodge. A right turn enters the broad-leaved woodlands of Park Ground Inclosure, first planted in 1810, and eventually continues through a narrow strip of ancient, unenclosed woodland, which is the driftway between Park Ground and Parkhill Inclosures. Beechen Lane is re-joined, and nearby is more ancient, unenclosed woodland that has in its midst an old, quite extensive area of fairly shallow, man-made pits. Exact age is uncertain, and so is the material extracted. Maybe it was marl, a lime-rich substance used to enrich the land in the days before modern fertilisers were introduced. Or maybe it was clay, a valuable brick-making resource that can be found in a number of places on this side of Lyndhurst. Evidence of surface gravel, however, strongly suggests that this is actually an old gravel pit. Notice here also, the Park Pale, a prominent earthen bank and ditch that surrounded the medieval deer park known latterly as Lyndhurst Old Park. The bank and ditch date back to at least the 13th century. 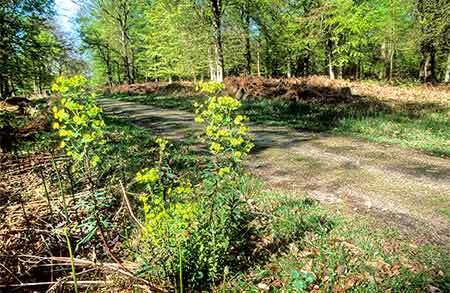 The route continues through the coniferous woodland of Denny Inclosure and the broadleaves of Little Holmhill - holm in the New Forest means holly. Both these woodlands are relatively young - they were first inclosed in 1829 and 1870, respectively. The Salt Way is crossed twice, and followed for a short distance. A track once used by men carrying salt inland from the coast, much of the Salt Way has been destroyed by later inclosure planting, but in places continues in use by walkers and others. Return is over Parkhill Lawn, past Pondhead Farm and on through Pondhead Inclosure. Previously known as Mine House Grounds, Pondhead was first planted in 1810. Many of the original oaks and beeches remain, together with occasional sweet chestnuts and other trees. Pondhead is unusual amongst New Forest woodlands as, for more than 20 years, stock-proof and deer-proof fencing has helped keep grazing and browsing pressure at bay. As a result, a rich under-storey has developed, wild flowers are abundant and a wide variety of spring and summer butterflies can be seen. In recent years, rotational hazel coppicing has also resumed, which further encourages wildlife interest. Roe deer and fallow deer are present in good numbers throughout the walk area. Foxes, too, particularly in winter and when with young to feed, hunt in daylight along the woodland rides; whilst buzzards frequently soar above the trees, mewing loudly. Hawfinches can occasionally be seen, and so too can a wide range of other, more common woodland birds.